Harpist Harriet Earis is a tickled-pink musician if ever there was one. Beaming at her audience like a leprechaun as she threaded her way through jigs and reels, one was tempted to shed inhibitions, join her on stage and do a poor imitation of Michael Flatley. But the music she created with drummer Sam Christie and bassist Andy Coughlan was, according to her blurb, a fusion of Celtic harp music, jazz and what was referred to as 'experimental backing'. This was misleading in the nicest possible way, for despite nominal recognition in Dave Brubeck's 'Take Five' and 'Unsquare Dance', the result of the mixture was not so much jazz-fusion as enhancement of a folk-dance tradition by a pair of accompanists steeped in jazz techniques. The only time Christie and Coughlan dug themsleves into a conventional jazz groove was in a piece Flatley wrote for the fiddler in his dance troupe. This spoke volumes for jazzmen, as Coughlan's bowed support of Earis in 'The Swan' and Christie's sharpening of the dance rhythms in Earis's own 'Laughing Wolf Jig' demonstrated total absorption and modification of skills. The Celtic harp lent itself to snappy, contrapuntal playing, as in 'Earl of Hyndford', another fiddle tune, but was also capable of a meditative quality free of the bigger concert harp's ethereal tendencies. It was enough to melt the heart and tickle the soles of a diehard purist. Audience participation was inevitable at the end. Thigh-slapping, foot-stamping and hand-clapping, mostly in that order, were rife. PONTRHYDFENDIGAID harpist Harriet Earis launches her new CD, From The Crooked Tree, at the Talbot Hotel, Tregaron on Friday 12th October (9pm). The music represents a change of directon for the highly regarded harpist, as The Harriet Earis Trio combine Celtic harp music with jazz backing for an unforgettable, high-energy, Celtic-jazz fusion. Harriet has toured worldwide as a solo harpist, and with Irish band 'Siansa'. A winner of the Open Stage Award at the Celtic Connections Festival, Glasgow, she is one of a handful of young musicians from Wales to win a place on the prestigious nationwide Live Music Now scheme. Drummer Sam Christie is a sensitive and expressive drummer with a wealth of jazz experience. He recently toured as part of the band 'Dynamite Dream', and he presents a Sunday night jazz show on Radio Ceredigion. Swansea-born bassist Andy Coughlan is one of the busiest musicians in Wales. TheFrom The Crooked Tree album was created at his own studio. "Harriet Earis is a young harpist from England, now living in Wales, who draws on Scotland and Ireland for her repertoire. She plucks her way through jigs, reels and hornpipes with sparkling verve. Her strong sense of melody coupled with some pretty funky left hand action makes for bright, high-energy performance. Guest musicians usually enhance a solo artist's album and this is definitely the case here. Overall a thoroughly enjoyable album." "This enjoyable offering from clàrsach player Harriet Earis showcases the melodic, rather than simply the harmonic, qualities of the instrument. The harp is often thought of as an accompanying instrument, partly due its decidedly soft acoustics. However, Earis demonstrates that with the right treatment it can stand up admirably to substantial back-up from a number of other instruments. The tune selections themselves have a solid Irish feel, and some of her finest playing emerges on dance tunes such as 'The Gold Ring', a 7-part pipe jig played with verve and finesse. Through her unhurried pace and sensitive arrangements, Earis also exposes the underlying beauty in the melodies that is easily overlooked in faster tempos. Contributions from guest musician Wu on the xiao - an ancient Chinese flute - add additional levels of interpretation and interest. His playing on 'The Curlew' is especially notable as he emulates bird song in quick passages of tremolo and wavering melody riffs. Gaelic singer Nic Raith - from Barra extraction - also contributes a few numbers, the best being her rendition of "A' Bhirlinn Bharrach". The final track on the album, a nicely-arranged stramash featuring most of the guest musicians, puts a lively and capable cap on this cheery and relaxing album. 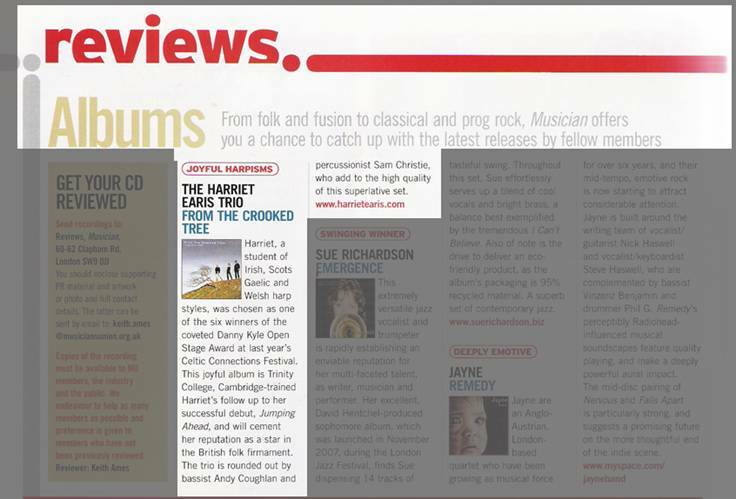 "Return to Camden Town Festival" Siansa Concert Review "If not the highlight of the festival, then certainly one of them was the eagerly anticipated midweek concert featuring Sean Keane and Niamh Parsons. The London Irish Centre was absolutely packed to capacity....... more than one audience member mentioned that the support band Siansa was worth the ticket price alone." "Harriet Earis is one of the most talented harpists in the U.K. The 20-year old English girl was born and raised in Guildford but moved to Aberystwyth (Wales) about two years ago. Since 1998 she has been reading Celtic Studies at the University of Cambridge and has learnt Irish, Scottish Gaelic and Welsh in areas where those languages are still spoken. As the youngest member of the London-Irish band "Siansa" and a university ensemble, she's quite a busy musician. This year she won the "Harper of All-Britain" title. "Irish Spirits" ended at around half past eleven with a session where Harriet Earis, Rolf Wagels and "An Tor" played two sets of jigs and Seán Kilkenny came up on stage again (joined by Connie Grund a local dancer from the audience). First reactions from artists and audience prove that there has to be a 2nd "Irish Spirits" Festival next year. The organizers are talking about a two-day festival for 2001 now." "It was standing room only by 8.30pm on Wednesday 3rd September and only room to squeeze an arm through the bodies at the bar in order to shake money at the bar staff. It was more like New Year's Eve than mid-week in early autumn. From a small corner of the pub came the sound of traditional Scottish and Irish folk tunes played by a fiddle (Imogen Gunner), pipes (Colman Connolly) and a Celtic harp (Harriet Earis). Harriet is skilful in playing both lyrically and as an accompanist - she can take a tune and make it heard." It was a real treat to hear the harp as part of a folk trio, adding a real magical quality to the music.